Even though I love painting with watercolors, it seems that I never make the time to do it. This time, I was determined to put brush to paper. I pulled out my water mug, (my Uncle Buck's old coffee cup) brush, and paint palette then got to work on the piece above. Click on the above image to see the individual names of the colors. After wasting money on student grade water colors such as Van Gogh and Cottman, I stepped up to the real deal - artist grade watercolors. Yes, they do cost more - but the quality is so much better. Student grade watercolors contain more "filler" and often times are impossible to mix. 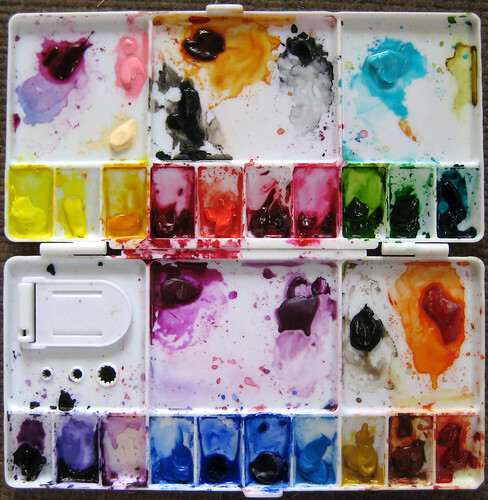 (The results are muddy) Artist grade paints contain more pigment and are much more vibrant. They also make mixing MUCH better. 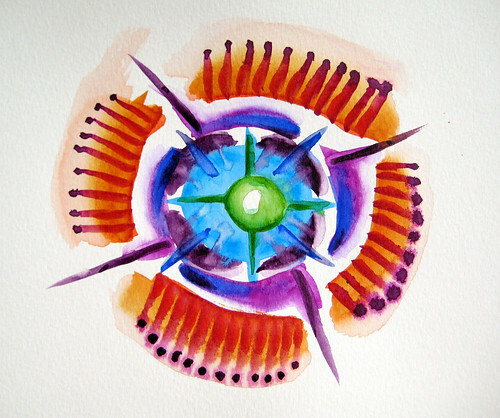 I think a lot of people experiment with watercolor by buying the inexpensive paints and end up not using them because the results are not what they expected. My paints are purchased by the tube, and I prefer the brands Holbein and Daniel Smith. You don't need to start with as many colors that I have, I have a lot of what are called, "convenience colors." Convenience colors are pre-mixed colors like purple, orange and green - colors that you could mix yourself from the primary colors, but it's more convenient to have it already mixed in the tube. There are actually two sets of primary colors - a cool, and a warm. each contain a variation of a blue, a yellow and a red. Sometimes a warm red might not play well with a cool blue. It's all about experimentation. When buying paints, think about what you really want to be painting. I didn't do this when I started buying paints, and now I have a lot of colors that I don't really use. (Like a lot of the blues...) I do mostly all brightly colored abstracts, and I am working to simplify my palette. Nice work! Yup Holbein and DS tube paints both consistently produce the brightest saturated washes. Wanted you to know that, as a beginning watercolorist (again), I appreciate this post especially. Although, I value your comments on all the materials thus far. Thank you for sharing.